story by Brian Ademaekers | photo by Albert Yee. Bob Fishman (center), founder, and Deneene Brockington (Right), director, oversee a purchase at the Equal Dollars Consignment Shop.It’s a Monday afternoon in mid-February and a half-dozen Strawberry Mansion residents gather in a building at 30th and Ridge Streets. They stand around tables loaded with vibrant, fresh vegetables, like lettuce, mushrooms and bean sprouts. One resident, Beth Lisby, talks excitedly about her dinner plans: chicken salad over a bed of fresh green lettuce with plump tomatoes and yellow onion. It’s a simple meal, but it’s one made with high-quality, fresh vegetables in a neighborhood where fresh vegetables can be a challenge to find. Adding to the satisfaction of the meal is how Lisby earns her bounty. During the week, she spends her time caring for elderly neighbors, making sure they are warm, well-fed and have their prescriptions filled. “I’ll even do the ladies’ hair, if they want that,” she says with a grin. Part of her earnings goes toward the box of fresh produce she takes home each week. But Lisby doesn’t pay for her dinner with a few George Washingtons. Her bills feature the face of Philadelphia’s Alain Leroy Locke, the first black Rhodes Scholar. 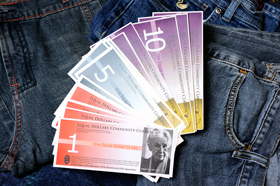 This money — known as Equal Dollars — is a local currency used by a growing group of more than 2,000 Philadelphians. The Equal Dollars story begins in 1996, when Bob Fishman — founder and CEO of the $230 million-per-year nonprofit Resources for Human Development (RHD) — encountered the idea for an alternative to the U.S. dollar. At the time, interest in community currency was heightening, in part fueled by an experiment in Ithaca, N.Y. known as “Ithaca Hours.” The man behind that effort, Paul Glover, remembers getting a call from Fishman, who wanted to know more about how Ithaca Hours (already in circulation for five years) were benefiting the upstate community of artists, students and farmers. “At the time, a lot of people were sitting around their kitchen tables and getting excited about the idea of starting their own currency,” remembers Glover, author of the local currency how-to book Hometown Money, and now a Philadelphian himself. But, unlike many of those people in the 1990s, Fishman followed through on the idea, and Equal Dollars was born. Fishman says the concept for Equal Dollars sprang from the same passion that led him to start RHD back in 1970. As one of the bigger nonprofits in the region, RHD serves communities in 14 states with programs targeting issues such as addiction, homelessness and neighborhood development. At age 77, Fishman, a Bala Cynwyd resident with an impressively quick mind and boundless enthusiasm for new ideas, seems more inclined to add to that work than scale back. Fishman stumbled upon a foe he found to be especially insidious: the American dollar. At the heart of Fishman’s critique of the dollar is that it’s an interest-bearing currency. These currencies, he argues, put pressure on people and institutions to make a profit at every turn — if you’re going to pay back the interest owed on your money, you have to make a profit. In this system, the only investments that have value are the ones that can turn a profit. And that, says Fishman, explains why a vast range of services and goods with real human value are neglected or wasted. With Equal Dollars, Fishman set out to create a currency that gives value to the kinds of things our economic system overlooks. RHD, with its considerable financial clout and extensive network of services, acts as a Federal Reserve and Treasury for the currency by printing the bills and issuing them to employees and members who sign up for the program. To start, members pay a $10 fee and get =$50 (Equal Dollars) in return. For 12 years, Equal Dollars worked within a fairly narrow network of businesses that allowed members to purchase items like jewelry or clothing accessories. Yet it was lacking two crucial elements that Glover says a community currency needs to thrive: true value that U.S. dollars don’t acknowledge and a constant ambassador to educate people about that value. Brockington was hired in 2008 as the new director of the Equal Dollars program. Although she arrived with 20 years of experience in nonprofits, there wasn’t much in her background that prepared her to tackle the issue of Equal Dollars’ lackluster life in the community. But Fishman says she jumped into the challenge with a creative gusto that impressed him. Brockington discovered the value she was looking for almost by accident during a visit to the local distribution center of U.S. Foods, a massive foodservices company with which RHD has extensive contracts. “Someone in their produce department said ‘Hey, do you need bananas?’ and we said ‘Sure, we’ll take bananas,’” recalls Brockington. “They said they throw away bananas every week, so we sent a truck — a rented U-Haul truck at the time — and not only did they give us bananas, but they gave us six skids of produce” that were headed for a landfill. If there’s a defining moment in the Equal Dollars story, this is it. From those bananas and six skids of produce the food market was born, and the currency finally had the value it desperately needed. In 2012, the amount of Equal Dollars in circulation rose 50 percent from =$200,000 to =$300,000. Working at the market is just one way people earn Equal Dollars. In 2010, the roughly 300 employees at RHD received a =$50 bonus. (Fishman takes about =$1,000 in his salary.) RHD has a pharmacy where employees can use up to =$5 toward co-pays, and the campus is also home to the Treasure Chest, a consignment shop where clothes and other items are traded and resold for Equal Dollars. With a fully implemented Internet banking system, members can shop on Equal Dollars’ online marketplace where they can buy everything from refurbished bikes to cooking lessons. Outside of RHD, Brockington has arranged for organizations to reward volunteer work with Equal Dollars — like the work Lisby does for her neighbors in Strawberry Mansion. In that neighborhood, the community group Project Strawberry Mansion acts as a broker for Equal Dollars. Other communities have taken Strawberry Mansion’s lead. Similar food markets have recently opened in Feltonville and Port Richmond as well. Equal Dollars made an even bolder investment in food last summer when they converted a 14,000-square-foot vacant lot in North Philadelphia into an urban farm with 40 raised beds; volunteers at the Equal Dollars Urban Farm are paid in the currency. And, as a sign of the growing reach of Equal Dollars, several Lancaster County Amish families are now accepting them as partial payments for certain foods sold at the main Equal Dollars market during the summer. Produce has included potatoes, peppers, onions and green beans. For Fishman, seeing this recent explosion in Equal Dollar use is vindication. Equal Dollars, he says, really are adding value to labor, goods and people in Philadelphia neighborhoods that profit-driven federal dollars have long neglected. He hopes that the next step for the project will be to work with City Hall, allowing residents to pay for services or even taxes with Equal Dollars that the city could then use to compensate RHD for contracts already in place. Given the typically creativity-adverse nature of bureaucratic city government, this seems a long shot. But Equal Dollars was always a bit of an impossible dream, and that certainly didn’t stop Fishman before. That wild aspect of it — the sheer chutzpah of running a currency parallel to the all-powerful American dollar — has made the Equal Dollars experiment particularly rewarding for Fishman and his team. Who’s On the Equal Dollar? =$5, =$10, =$20 bills feature Alain LeRoy Locke (1885-1954), a Philadelphia native known as the father of the Harlem Renaissance and the first black Rhodes Scholar. =$1 bills feature Maggie Kuhn (1905-1995). Kuhn, also a Philadelphian, was an early anti-ageism activist who, in 1970, after being forced to retire, founded the Gray Panthers.